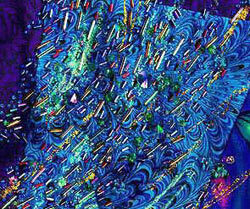 I’ve always loved the color purple. Almost every shade of purple delights me. 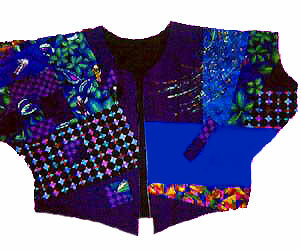 This is an original one-of-a-kind jacket that I created around 1992, using a Vogue designer jacket pattern. The fabrics are all 100% cottons. On half of the front, I have hand-beaded with glass bugle and seed beads. I’ve also painted it with glitter paint. 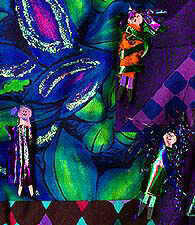 On the other half of the jacket, front and back, I’ve made small dolls from crafts clothespins. Each doll is unique, and all of them are a little wild and off-balance. This is a flashy jacket and — as of this writing — it’s a little 1980s in style. However, dazzle keeps returning to fashion, so this jacket will be stylish again in the future. Meanwhile, it’s a great and whimsical display item.